I was a student at Evergreen State College, and it must have happened during my second year, when I was seriously getting into jazz piano. I lived in this little cottage on a bay in Puget Sound, outside of Olympia, Washington. And I remember lying on the bed and listening to the [1976 solo-piano recording] Air Above Mountains over and over again. That was when I fell in love with Cecil. The way he moved between the high-energy, clustery textures and his sublimely harmonic lyricism felt so intuitive and natural to me. At the time I was studying bebop. I’m sure I’d heard [avant-garde violinist and mentor] Leroy Jenkins by this point. So I knew there was a world beyond bebop, and I was already intrigued by it. There were two records I bought at that time which were on constant repeat: Air Above Mountains and Ornette Coleman’s The Shape of Jazz to Come. Ornette’s recording was a bit closer to the bebop artists I was listening to; Cecil’s was just completely in another world. The fact that I had grown up listening to and playing a lot of classical and 20th-century piano music, I think I recognized some of that in Cecil. I was fortunate to hear him many times after I moved to New York in the mid-’80s. 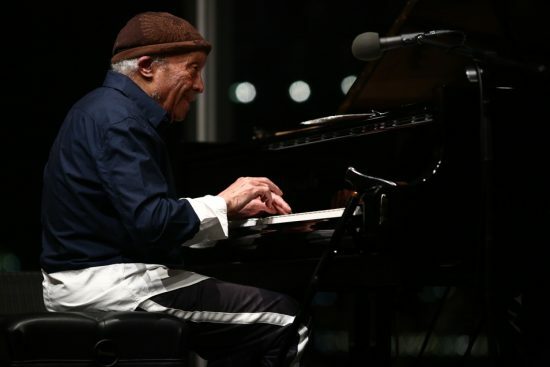 I remember a concert at Alice Tully Hall where I was mesmerized by watching his hands—the way he seemed to draw the sound out of the keys as he gestured. I heard him in 1984 at Carnegie Hall, on a double bill with Oscar Peterson, which was an illuminating juxtaposition. I saw him perform with the dancer Min Tanaka in SoHo in 1994, which was hugely inspiring. I’ve gone on to work with Oguri, a Japanese dancer and choreographer who, before he moved to the U.S., actually trained with Min Tanaka. We didn’t have the same sort of personal connection I had with some of the AACM musicians, or with Jaki Byard and Don Pullen, both of whom I met and studied with early on. Cecil was someone I had known the longest in terms of his music, but he was the most mysterious to me. I finally met him in the early-to-mid-’90s, when I was working with Butch Morris at the Knitting Factory on Houston Street. Cecil was hanging out at the Knitting Factory just because he liked to be on the scene; he was very supportive of other musicians. Butch said, “Oh, Myra, have you ever met Cecil?” He took me up to meet him and Cecil said something very nice about how he’d already been listening to my music, which really meant a lot to me. I remember getting to hang with him at the Portland Jazz Festival in 2008. I was playing there, and I was invited to introduce Cecil, who was giving a solo concert. And so I spent time with him backstage before and after his performance. He always treated me like an old friend. Besides Air Above Mountains, which I still go back to, I’ve always loved [1960’s] The World of Cecil Taylor, which, interestingly enough, I got into after Air Above Mountains. The World was recorded in that period when he was still dealing with more straight-ahead rhythm sections. One cut off that album that almost all of my colleagues have cited recently, “This Nearly Was Mine,” was a huge favorite, as was a piece called “Air.” I listened to various other solo concerts; I remember listening to For Olim right around the time that my father died, and that was another one I played on repeat. Later, when I started getting more into his ensemble music, it was Unit Structures that was probably the most important. I was fascinated by the kind of ensemble he was putting together, the motifs and colors he used, how the musicians were relating to each other, and the way he was leading from the piano. “Enter, Evening” was a piece off that record that is one of my favorites. Cecil had this quality about him that was quite mystical, that touched me on such a deep level. Different yet also similar to Ornette, he had a way of talking and thinking that was always in the poetic realm. Even though he was very intellectual, it wasn’t the intellectual part of his discourse that spoke as directly to me as the poetic. There was that incantatory aspect to the way he might start a piece or stop in the middle and chant something. He was always hovering around the idea of language and speaking in tongues, or glossolalia, and I’ve absorbed a fascination with those things. He also had a wicked wit. As someone who was naturally looking to other art forms, whether it was literature or architecture or movement, Cecil’s aesthetic was a formative inspiration. But he was perhaps most influential to me in a way that goes beyond the rational and the intellectual and even the sonic. I spent around five years learning from the Huichol Indians—their cosmology and spiritual traditions, and I was able to go on pilgrimage to some of their sacred sites. One of the things that the Huichol talk about is this idea of the gods that inhabit their landscape opening doorways for them to greater understanding, to a sense of connection with the world around them, and to the divine. I associate the first time I heard Air Above Mountains as a kind of initiation—that somehow Cecil was opening this doorway to another world for me. Maybe that’s all I need to say. He lit a fire in me to aspire to make music that could do the same thing for others. As an educator I cover Cecil in my classes and we study his music. I’ve had students come to me and say, “How do you listen to this?” I always respond that putting myself in the still point at the center of the storm, in a meditative state, was the way I best listened to his music. For me it is always an ecstatic experience.